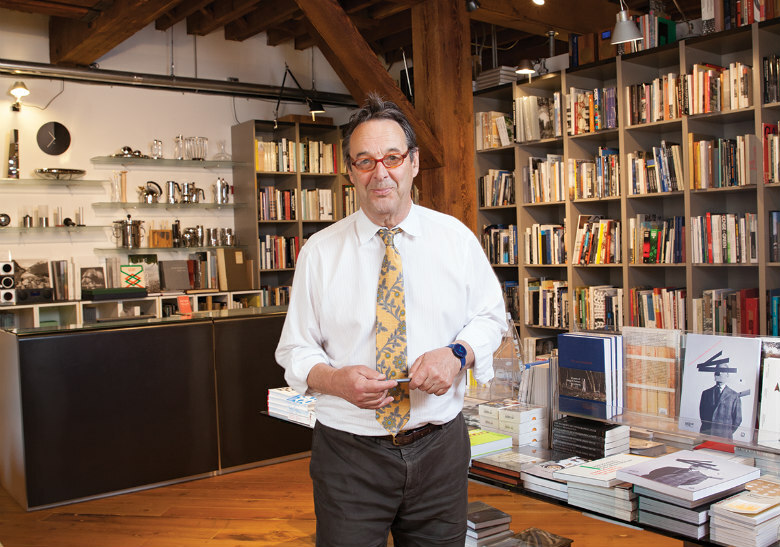 Peter Miller’s newly relocated bookstore remains as distinctive as the man who runs it. Peter Miller has many passions in life, from a love of design, architecture and books to travel, cooking and dining. You’ll encounter many of them with a visit to Peter Miller Books his recently relocated, design-focused bookshop, which moved to a quiet space tucked away in Pioneer Square after decades in both Belltown and Pike Place Market. Like many city dwellers these days, Miller was priced out of his old ’hood, but he’s embraced the change. “Thirty years ago, [the old location] was perfect for us,” he says, noting that the Market has changed a lot over the years, and the new location offers the slower pace of a smaller neighborhood, which allows for more interaction with his customers, along with the area’s resident architects and designers. Surprisingly, Miller’s early background is neither in design nor architecture but in English (which he studied in graduate school at Harvard) and food (as a day chef at Das Gasthaus, a hip gastropub in the ’70s). His time as a chef inspired a lifelong love of food and more recently, his two published books: Lunch at the Shop and Five Ways to Cook Asparagus. He discovered design when he opened his first bookstore in Wallingford, where he carried a selection of design books, such as The Japanese House by Heinrich Engel and others about Shaker furniture. “These books seemed the most carefully done, the handsomest and the most enduring in the store,” he recalls. He developed a fascination with design and architecture, topics that had never been part of his studies. “It was like discovering an entirely new culture,” he says. People from all over the country come into the shop to browse through his beautiful books, architecture supplies and design objects. Miller considers himself a curator, and selects his inventory with an eye towards quality. “People want something durable–something they can enjoy forever,” he says, pointing out a gleaming, Italian-made espresso maker for sale. If you want to talk design, food or travel, chances are he’ll pour you a shot of espresso from it, too.